The sun is currently in Gemini (May 20th - June 21st). If your sun sign is not Gemini, these stones are still useful. The zodiac energy of each sign surrounds all of us based on the time of the year. The energies of Gemini are at work now. Gemini is an interesting sign and it just so happens to be my own sun sign. Gemini is full of duality symbolized by the twins. When the sun is in the sign of Gemini you may find positive and negative energies become more obvious to you. The airy sign of Gemini is full of thinkers that live in their heads, more than any other sign. They are quick-witted and at the same time, think things all the way through. Geminis are very direct. Whether or not you want to hear it they are excellent at giving advice. But you really should listen when a Gemini give you advice, even if you don't want their help, it comes from a genuine place. Any Agate would be a really good earthy stone for Geminis or use while the sun is in Gemini because overall Agates are great for clarity. The airy Gemini walks around with their head in the clouds and could benefit from a stone that brings stability and balance. More specifically, choose a black and a white agate for balance and help bring all those thoughts Geminis carry around back down to earth where they can be put to use. Another Agate would be Blue Lace Agate which can help a Gemini communicate their thoughts and advice more calmly and gently. Apatite, especially blue apatite would be beneficial for use at this time of the year as it is another stone that can aid in clarifying and communicating some of those thoughts that are stuck in your head. Blue sapphire is a beautiful stone that, like some of the others mentioned here, helps a Gemini communicate more effectively and with wisdom. Another blue stone that works well with the throat chakra in helping to bring clarity. It is also a wonderful stone for working with the divine to communicate on a higher level. Geminis are sometimes considered the Dr. Jekyll and Mr. Hyde of the zodiac: you never know which one you're gonna get. Chrysocolla helps calm the duality and turns the negative energy into positive so you can make use of both sides. The tourmaline incorporated into this Jasper makes it a great stone for working with dualities. Dalmatian Jasper is a grounding stone which pulls all that air energy of this time of year back to earth. It is also beneficial in transmuting negative energy. Leopardskin Jasper is another harmony Jasper to try. Howlite is a calming stone, which can aid you in bringing awareness to the meaning of your thoughts and eliminate any selfish tendencies. Often called "New Jade," Serpentine is a wonderful stone for manifestation and bringing abundance and healing into your life. Geminis may benefit from working with a calming stone like Serpentine more than another prosperity stone. Tigers eye, especially Golden Tigers Eye is another stone that provides balance. Gemini is a sign of duality and can benefit from a stone that balances, especially one that also helps you overcome stubbornness. Ametrine gets its name by combining AMEthyst and ciTRINE, which is exactly what this rarely found stone is made of. Due to is dual color it is wonderful for balancing a duality and removing negativity. Sometimes you just need to throw some water on those vibrant Geminis. Aquamarine works the throat and heart chakra to help a Gemini communicate more gently and in a loving manner. In this way, their words are recieved better. Chrysoprase helps release distress and depression, which Geminis tend toward. There are often too many thoughts, both positive and negative, bouncing around in a Geminis head. This hopeful and compassionate stone helps you look at the positives instead of the negatives. Along the lines of the airy Gemini energy needing earth energy for grounding, Hematite helps pull your head back to earth. Hematite a balances and detoxifies. Want my list of Gemini crystals? Click the button below to request your list to be sent to your inbox. 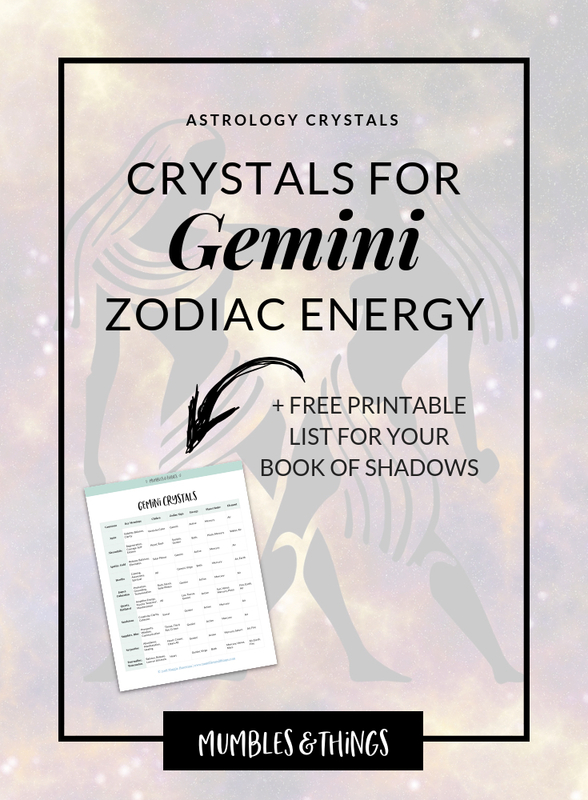 This list includes the top 10 crystals associated with the zodiac sign Gemini, plus, the three key uses, primary chakras, polar energy, planetary ruler and element correspondence.